Coyotes (Canis latrans) are wild canines with gestation periods similar to those of dogs. The gestation cycle typically takes 63 days, give or take a day or two. In most packs, the alpha pair is the only one to mate, but the entire pack often helps rear the young. 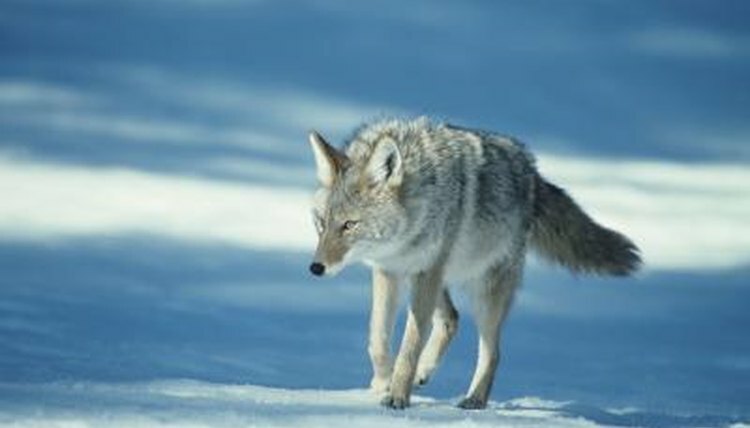 In the southern United States, coyotes mate during February; in the northern United States, alphas mate during March. Gestation is usually 63 days past the date of ovulation. The female will be receptive to the male by the day after ovulation, but sperm may take a week to reach the eggs. After fertilization, the embryos float in the uterus until they implant later. The female’s heat cycle is completed by week two. In week three, a placenta develops as the embryos implant, which secretes relaxin, a hormone. By week five, females have larger nutritional needs, as the fetuses get bigger. During week seven, the last organs are developing -- the coats and skeletons. Towards the end of week eight, the female starts producing milk. Canines begin to search for an area for whelp in the last weeks of gestation, and coyotes are no exception. The pregnant female will search for a den and may reuse an old den or dig a new one. The pups will be born approximately 63 to 70 days after mating took place. Coyote litters often end up as four to seven pups, although larger ones may be seen with plentiful resources.